Gamification. It’s a buzzword that’s hard to escape if you work in the marketing industry, and even more inescapable if you deal with the ever-expanding elearning marketplace. Merriam-Webster defines it as “the process of adding games or game-like elements to something (as a task) so as to encourage participation”. As elements of game playing began to blend with the learning process, criticism was swift to follow with people remarking that gamification was “an inadvertent con” with its simplicity, or exists only “to conceal, to impress. or to coerce”. Regardless of the backlash, it’s hard to deny that gamification is only growing in popularity. According to a widely cited study by Gartner Inc., more than 50 percent of organizations that manage innovation processes will gamify those processes by 2015. 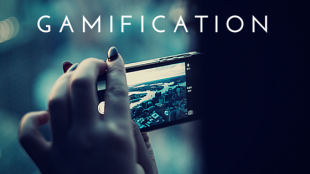 Below are two ways you might come across gamification in the modern world. The first is as an electronic marketing tool. One subtle example of gamification as a marketing strategy comes in the form of Google Doodles, popularized in 2000. While the doodles began as elaborate designs of the word Google, they quickly evolved to become interactive for users, hosting mini games such as snake, music-creators, or other easily manipulated games. In fact, there is now an entire team at Google responsible for the Doodles! This solidified their brand persona as being professional but laid back and friendly. By showing an element of humanity, Google avoided being branded as the cold, dominating tech company, and found an emotional connection to their users. The second example of gamification marketing is the commonly used Starbucks Reward app. Purchasing beverages and food items with a Starbucks Card allows the user to accumulate stars to work up to earning free drinks and merchandise. Doesn’t sound all that different from a promotion where spending a certain amount of money gets you a discount, right? But when you add in the visual aspect of earning stars on the mobile app and the fact that you can work your way up to three levels, it becomes clear that it is more of a gamification strategy than anything. Compliance Cartoons are well known for their popular, interactive, gamified courses on OpenSesame. In Crime Scene Investigation, the learner plays as Buster, a drug sniffing dog, and is able to drag their mouse around a simulated office to choose what evidence in the environment might be designated as valid. The fresh visuals accompanying the scenario where the learner has control over events makes this course particularly memorable. “This animation based online learning program on Conducting Productive Meetings aims at providing the participants with fundamental tips and techniques to enhance the effectiveness of meeting and make them highly productive both in terms of the time saves and outcomes achieved,” reads the course description on OpenSesame. However, as opposed to other soft-skills lessons, this XLPRO Training Solutions avoids the dreary powerpoint strategy and uses audio narration, scenarios, timed quizzes, and animated games to help the learner along the way. Is isn’t difficult to see why this Cegos course on OS+ is one of the most popular, highly-rated courses offered for Communication. What it lacks in levels and points, it makes up for in interactivity, with dragging abilities, simulations, matching games, and more. Do you think gamification is a step forward or a leap backwards? How has gamification affected your workplace? Let us know in the comments below.